This image was captured in the kitchen, where I spend a lot of my time these days. The sun filtered in the window to the side of my kitchen table and gave a wonderful glow to the crisp fortune cookie I had just baked, and then broken. I really enjoyed the message on the fortune inside. Shakespeare was such a master of language and a clever poet. It was a perfectly fortunate quote. To enhance this image I simply increased the saturation of the colors to make the blue in the little dish pop in the sunlight. I filtered the image to add interest to the shading and texture of the cookie, but not too much, as I didn't want to lose the definition of the script on the sentiment inside. 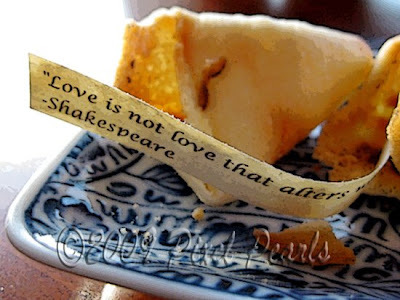 After all "Love is not love that alters...." and yet I think it is sometimes wise to filter and saturate, don't you?